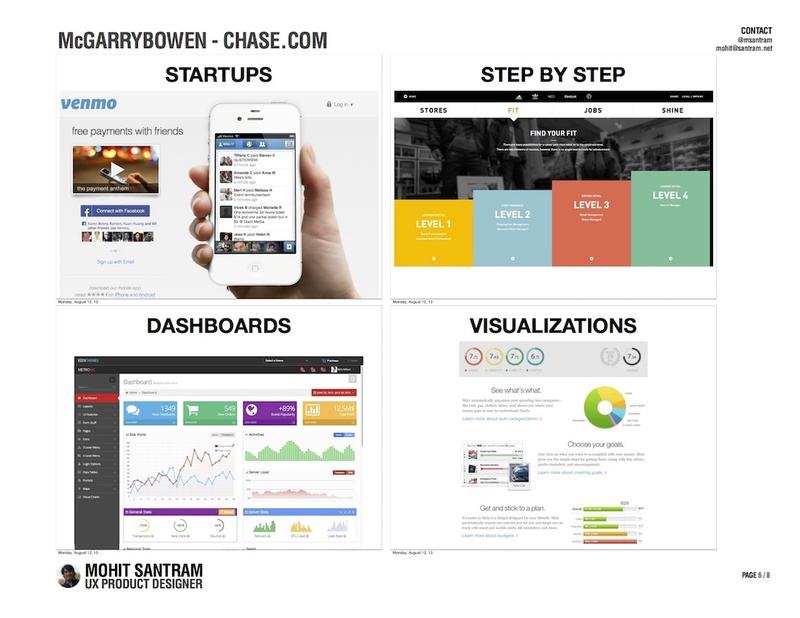 In July of 2013, I joined the McGarryBowen Experience Design team for a three month project to work upon the J.P. Morgan Chase account. 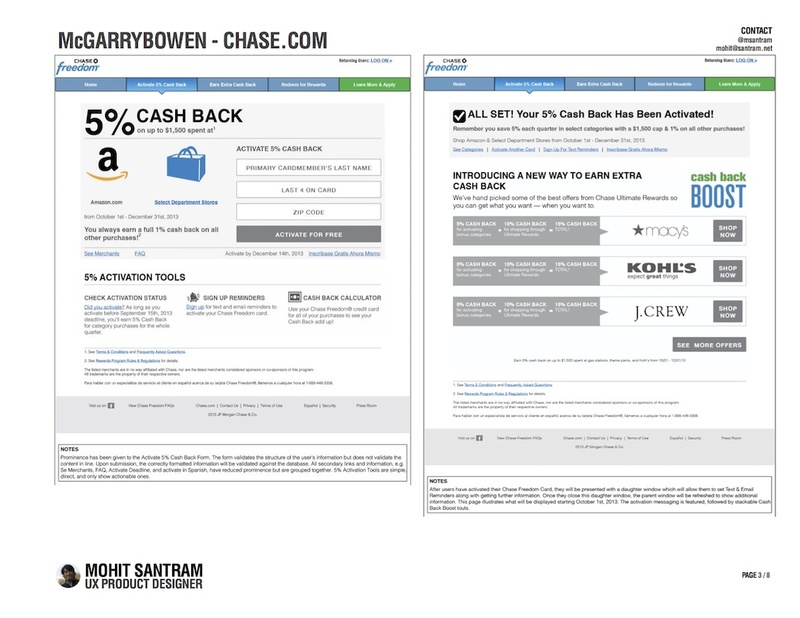 Along with gearing up for a major pitch presentation to win the entire J.P. Morgan Chase account, McGarryBowen was tasked with maintain and building out several smaller pieces of the business including the Chase Freedom card. J.P. Morgan Chase was looking to consolidate all of their digital work with one Digital Marketing Agency. I was working for McGarryBowen upon several projects including the Chase Freedom card account. We were tasked with building a comprehensive pitch to win the entire J.P. Morgan Chase account. As part of a diverse team made up of User Experience Designers, Visual Designers, Copywriters, Account and Strategy members, our goal was to develop, build, and deliver a comprehensive pitch to the J.P. Morgan Chase team, as well as maintain our existing account for the Chase Freedom card website. 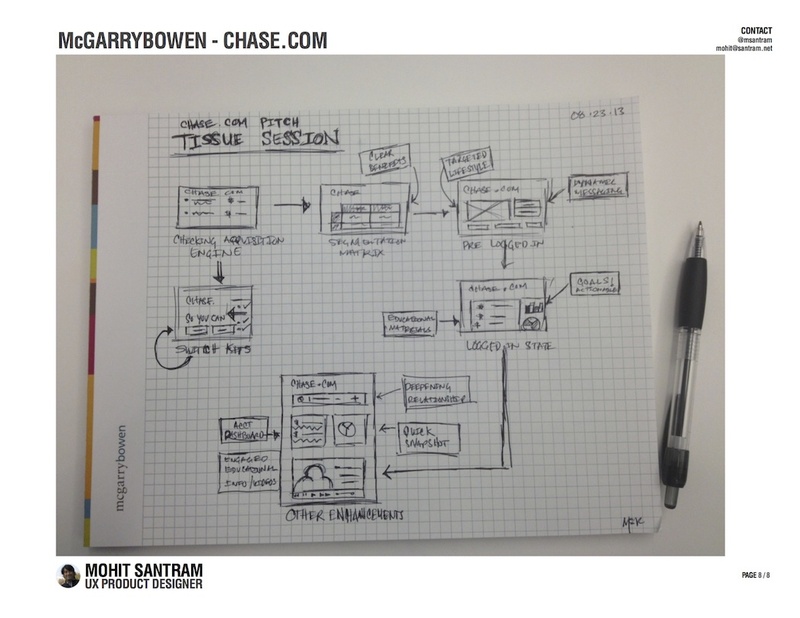 I was tasked with optimizing the desktop and mobile user experience on several Chase.com online sites. Additionally my responsibilities included wireframing, leading whiteboarding sessions, conducting research, building competitive analysis documents, developing concepts, and presenting findings to the team. Our team at McGarryBowen worked hard to put together our pitch to J.P. Morgan Chase, while also continuing our work on the Chase Freedom card account. 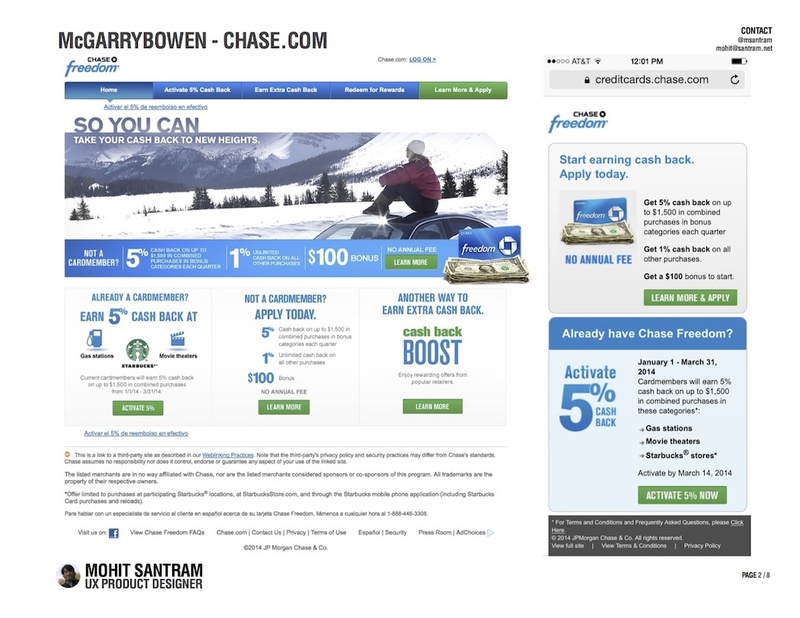 My first task was to help optimize the overall desktop & mobile user experience on the Chase.com/Freedom website. The primary navigation was simplified. The consumer value proposition was better explained with contextual examples along with providing easier ways for users to earn cash back. The mobile experience was simplified with emphasis placed upon facilitating the core actions of applying for a new card and activating for the quarterly benefits. Activating for quarterly cash back benefits was simplified within this desktop experience. Once a user has validated their card, optionally signed up for text or email reminders, they are presented with additional ways to increase their cash back bonuses. Our goal was to simplify the process and remove stumbling points for users using metrics data and specific user feedback. Experience Maps can be highly effective with understanding the complexities of user’s emotions, motivations, pain points, and innovation opportunities. 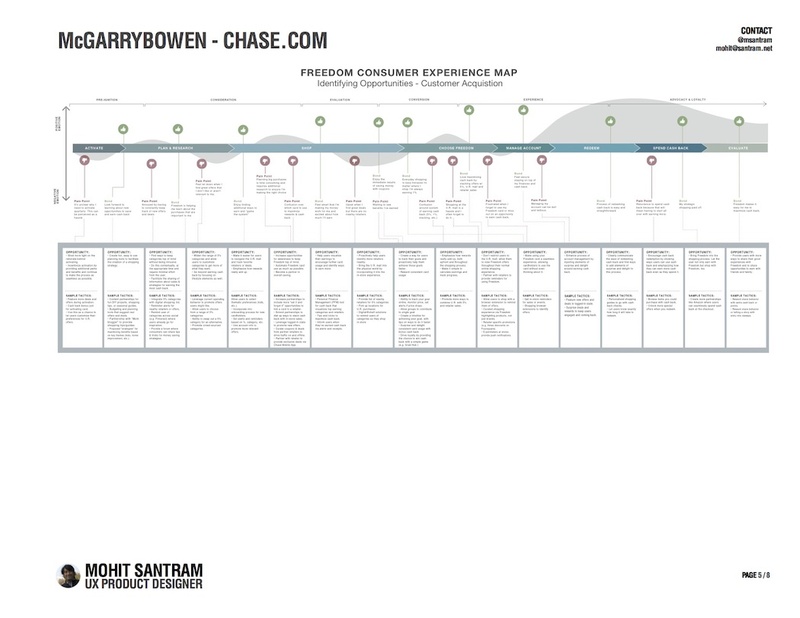 As a collective Experience Design team, we built several Experience Maps for many of of the J.P. Morgan Chase products & verticals. I built this Experience Map as well as the following map. 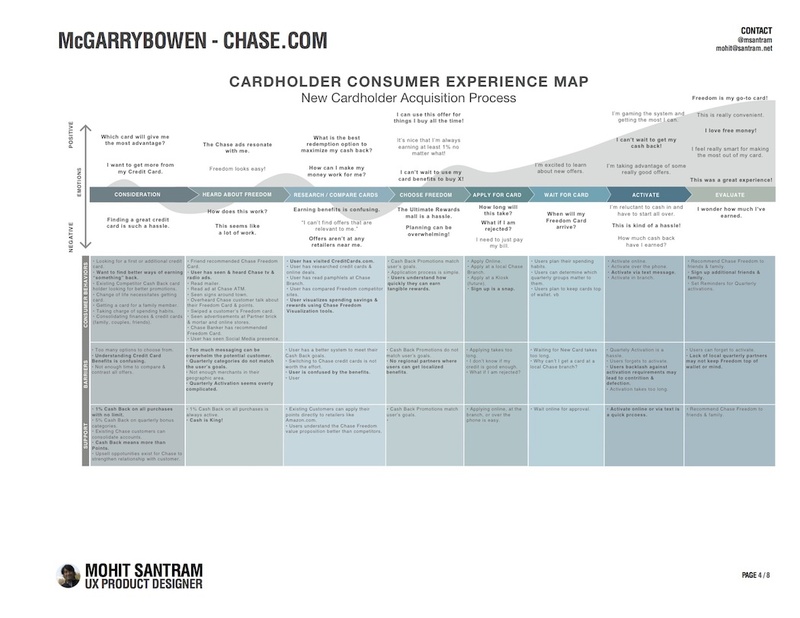 This User Experience Map was built to identify new customer acquisition opportunities for the Chase Freedom card. I conducted research into the banking, investing, and payments marketplace and compiled this Competitive Analysis with two team members to help guide the entire team through idea generation, scenarios, and concepts. This document is featured below as a UX download. 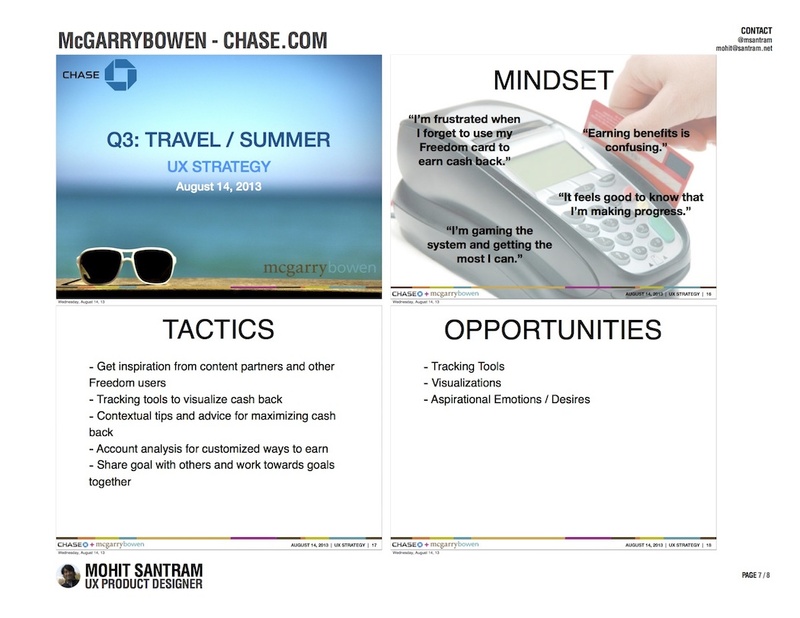 This UX Strategy document was presented to the entire pitch team to showcase several opportunities within the Chase Freedom quarterly bonus categories. Based upon user research and analysis of user metrics, I worked with another designer to compile our UX Strategy recommendations. My goal was to help other pitch team members understand and identify opportunities for improvement. Working through this project I learned a great deal about Chase, their customers, and opportunities to improve even the smallest customer experience. We collectively participated within Tissue Sessions to isolate ideas, areas of improvement, and k. This Tissue Session sketch illustrates my preferred user flow.